Twenty-two years ago today, the New Yorker published a remarkably exaggerated and unsupported claim. It was in the second part of “Remembering Satan,” Lawrence Wright’s article about the Paul Ingram case. 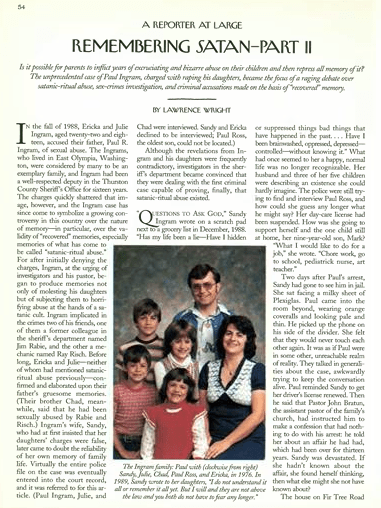 (Some of Wright’s claims about this case have since been debunked by Karen Olio and William Cornell’s peer-reviewed article, “The Facade of Scientific Documentation: A Case Study of Richard Ofshe’s Analysis of the Paul Ingram Case.”) Beyond the Ingram case, however, Wright asserted that what happened to the Ingrams was “actually happening to thousands of other people around the country who have been accused on the basis of recovered-memory testimony. Perhaps some of the memories are real; certainly many are false” (Wright, Remembering Satan–Part II, New Yorker, May 24, 1993, p.76). What evidence did Wright provide in support of his claim that there were “thousands” of cases? On what basis was he “certain” that “many” of those were false? None whatsoever. The “thousands” claim is pure fiction. There were thousands of phone calls to the False Memory Syndrome Foundation, which were often mischaracterized by the Foundation as “cases.” But Wright did not investigate any cases beyond Paul Ingram’s, so his certainty that hundreds, maybe thousands, of other cases were “false” is a measure of his prejudice, not a product of his reporting. Wright is an accomplished and award-winning author; but in this important instance, he got it wrong.